Comic Book Collector? Stop Buying Runs Backwards! Want to Be a Better Comic Book Collector? Stop Buying Runs Backwards! Every comic book collector wants to own the big key issues. But ironically, they spend thousands of Dollars buying non-key issues. Most never get to own the mega-keys they aspire to, because they tie up $$$s in common books instead of taking the plunge right away. THIS or THAT presents a guide on how the math breaks down when you buy a run of Amazing Spider-Man from #1 FORWARDS. If you prefer to read the article, skip below the video. 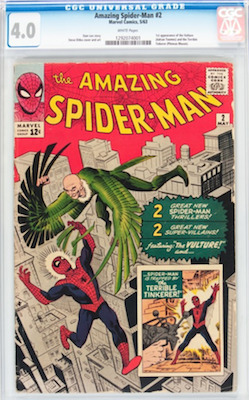 If you're a collector of Amazing Spider-Man comic books, chances are you don't have issue #1... yet. Probably you've dreamed of owning one for a long time. I have never been to your house. But I suspect if I did, I would find several long boxes filled with ASM comics. Some of them might have cost a few hundred bucks. Others will only have cost $10 or $20 or $30. Congratulations. You have made the same mistake that almost every comic book collector makes: buying runs backwards. 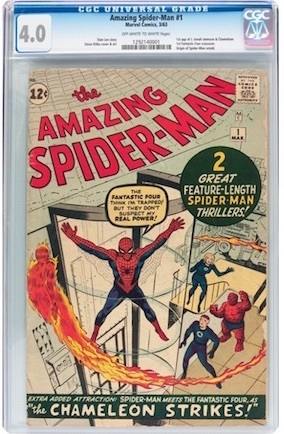 Did you ever stop to think about how the money in those long boxes could have been invested differently? Like, maybe in a decent copy of #1? Then you could go about the "fun" part of assembling the rest of the run. Meanwhile, your copy of #1 would be appreciating year after year! What do you mean, you can't afford a Spidey #1? The truth is, you can't afford to WAIT. 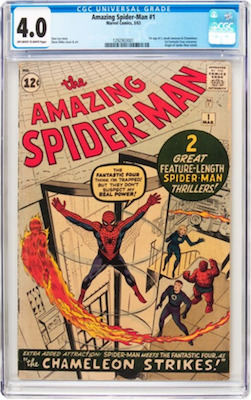 To demonstrate why, I priced an entire run of Amazing Spider-Man, most recent sale price, from #1 to #129, in CGC 4.0 (VG). Let's break this down a bit more, and show you why buying the later issues first costs you so much in the long run. In other words, almost exactly HALF the cost of the run is taken up by the first three issues. If you throw in ASM 4 ($500), then you reach the tipping point where more than half the investment goes into the four issues. Almost two thirds of the investment is contained in #1-10. Throw in #11-14 and you get to $10,950. That still means you have to spend $4,870 to obtain #15-#129. That is ALMOST the cost of #1. Buy the #1 instead of buying #15-#129, and THEN start working on issues #2-14. Think of all the effort it takes to chase down 114 issues of ASM. Think of all the shipping cost. Not to mention the almost $5,000 it will take in purchase costs to buy all those issues. You still have to store them, etc. This book is the most likely in the run to appreciate. Let’s say you buy #1 tomorrow, and focus on building up cash to buy #2-14 over the next 12 months. Then your plan is to fill in the run over the following 12 months. Total time to build your run: two years. What’s happened to prices of ASM #1 in the past two years? It looks as if your ASM #1 will appreciate about $500 per year. That means… if you buy #1 FIRST, you will have GAINED $1,000 before you finish the run at the end of two years. Reverse that math. Starting tomorrow, you buy #129 first and work backwards. Again, it takes you two years. But when you come to buy #1, now the price of entry is $6,500. You need $1,000 MORE to get the mega key issue. Not to mention many of the early keys (#2-#16, #20, #28, #39-#41, #50) will also have increased in price by the time you 'get to them' from working back from #129. The run could very well cost you $2,000 MORE to put together if you build it in reverse! You'll be a richer and smarter comic book collector if you follow our advice. 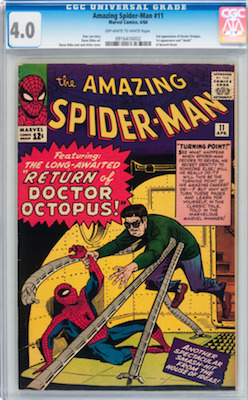 Appraise, Insure, or Sell Comic Books to us Today!